What technology do Russian troops have for demining Palmyra? The Russian Defense Ministry is sending sappers from the International Anti-Mine Center and robots to Syria to demine Palmyra. But what kind of technology can help clear an ancient city of explosive devices? The Uran-6 multifunctional robot is used for making passages in minefields and cleaning the territory of anti-personnel mines and explosive objects with an explosive mass of up to 1 kilogram. Weighing 6-7 tons, the robot-sapper is capable of mounting a wall of up to 1.2 meters (4 feet) high. It is remote-controlled at a distance of up to 1 kilometer (1,090 yards). The robot plows the earth and detonates all the mines it discovers. Weighing 14 tons, the robot is used for putting out fires around explosive objects. 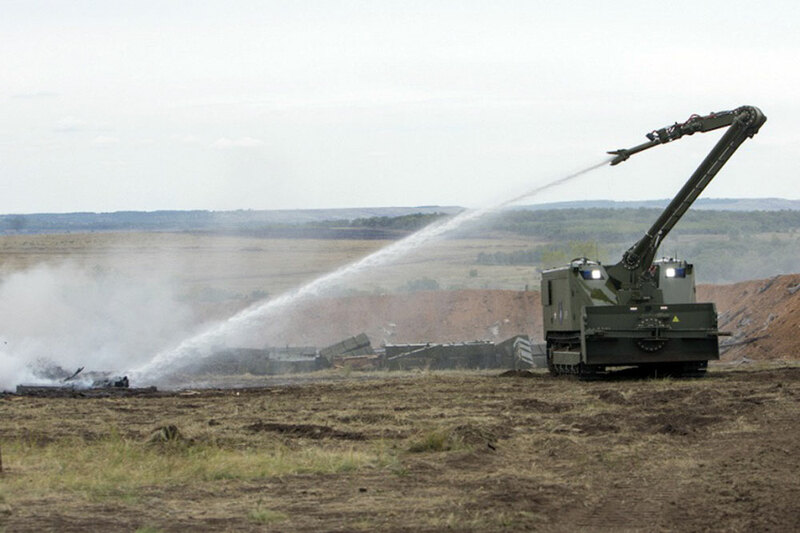 Its impressive dimensions are necessary for transporting significant quantities of water in its tank to the fire. It can be filled with two tons of water and 600 liters of foam. The robot not only puts out fires, it fills itself with water at fire hydrants or at artificial reservoirs. Uran-14 can approach a fire even if it is raining bullets and fragments. Its upper part contains a trunk manipulator, from which it can fire water and foam. The length of the continuous jet of water is 50 meters and that of the foam – at least 35. This robot is a reactive mobile demining system capable of making passages in anti-tank minefields during battle. The total mass of the explosive it can launch can reach 700 kilograms (1,500 lb). It demines through the striking power of the charge's explosion, which acts upon the mine's detonator. The robot, which has a crew of two, is unofficially called Zmei Gorynych ('the Slavic Dragon'). Each robot can transport two demining charges. The IMPS-2 helps detect explosive objects located in the soil or snow at a depth of 1.5 meters, behind barriers of non-magnetic materials and along reservoir coastlines at a depth of 1.5 meters. The armored elements of the Sokol (Falcon) suit are capable of protecting the sapper from small fragments and its helmet, which contains a protective visor, can withstand a 9-mm bullet fired from a distance of 25 meters. The suit weighs only 8.5 kilograms (19 lb). The Korshun (Kite) is capable of detecting explosive devices located behind various barriers: concrete and brick walls, barbed-wire fences and metallic nets; under asphalt and concrete-covered roads. It can detect remote-controlled mines and IEDs at a distance of up to 30 meters.